The Tenuta di Fiorano estate is only a few kilometers from the center of Rome, in an area between the Appia Antica (Appian Way) and the slopes of the Colli Albani (Alban Hills). The entrance to the estate is located at via di Fioranello 19 and is anything but ostentatious. It’s just an old, metal bar that opens to a long, winding dirt road lined by maritime pines that are over a century old. Past the first large granary, which currently being restored, there is a group of old buildings which house the estate’s administrative offices and its historic cellars. The dirt road continues on past a number of barns and farm houses towards the middle of the estate with an old vineyard to the right. Here it is worth making a stop just to enjoy the striking view of the Colli Albani and Castel Gandolfo, while on a clear day you can look towards Rome and see the profile of St Peter’s dome. Further down the road is the area of Santa Fresca, the heart of the estate. The buildings here, which were recently restored, and the church that gives its name to the area are all surrounded by wonderful botanical garden which reflects Prince Paolo Boncompagni Ludovisi’s love of nature and the Roman countryside, the richness of its ecosystem as well as the history of the Appia Antica area. The garden, in fact, is composed of all the varieties of plants and flowers used to adore its grand historic villas as well as plants he collected during his trips around the world. Today it is his son Prince Alessandro who takes care of the garden with his father’s same love and passion. 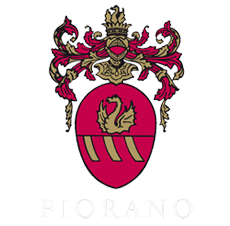 Tenuta di Fiorano has a surface area of some 200 hectares among vineyard, olive grove, crop field and pasture. The crops are routinely rotated and include wheat, trefoil and medicinal herbs. There are also many fruit trees but these are only for family use. The soil of Tenuta di Fiorano is totally of volcanic origin. The nearby ancient Latium Volcano, in fact, left enormous quantities of purple pozzolanic ash. Due to its size and position, Tenuta di Fiorano has been able to remain agriculturally self-sufficient and this, in turn, has allowed it to maintain a totally balanced ecosystem. The farming methods used have historically and rigorously been organic and this has kept the environment uncontaminated.